These last three weeks have been very busy and stressful. On the 26th of July at about 5am my wife woke me up saying that we needed to go to the hospital; her water broke. We went to the hospital and there the doctors and nurses monitored her. She had had previous c-section, so we were planning a c-section from the beginning. They scheduled it for 10am, but another lady that had come in had some complications, and the moved her in, and that bumped us back about an hour. At 11:57am Jay was born. I was in the room, but tried not to watch to closely the surgery; blood and guts make me woozy. They took him into the room next door where a couple of nurses watched him to see how well he was doing. This was to determine if he needed to go to the NICU. He did very well, and shortly after that they let me take him back in to show him to mom while the doctors stitched her up. A few days later on the 29th the doctors all gave the ok to go home. 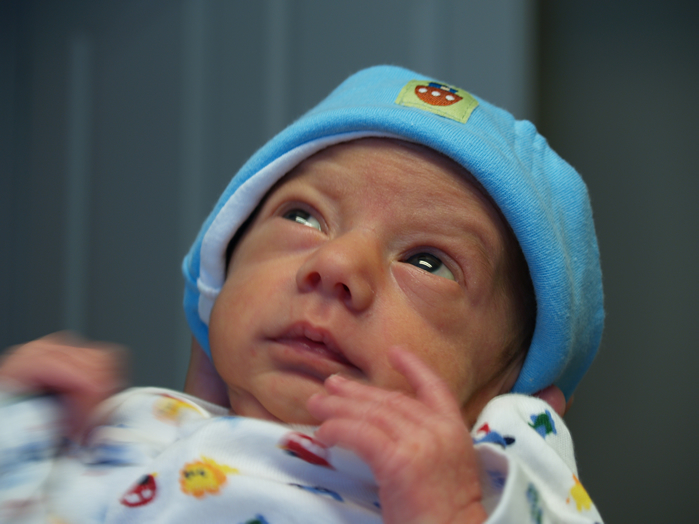 For the first few days Jay evaded the NICU, but unfortunately being 6 weeks early he did not start eating very well in that first week, and his bilirubin levels were high. They had us take him in on the 31st to the NICU. He was there for 8 days while we was treated for the high bilirubin, and got to the point where he was eating well. We have now had him home for 9 days. He is doing very well now, and we are very happy to have him with us.